We are all supporting players in Dulcie’s imaginary worlds. Occasionally, when I’ve only had four hours sleep, and checked my bank balance, and realised I can’t have a pretty new dress, I harrumph at being made to be the Beast or a troll or a witch; but mostly I enjoy my swagger as I’m cast as a prince, to slay dragons and kiss princesses and swirl my tiny daughter around the Ikea rug that is, in fact, a marbled ballroom dance floor. Himself the Elf is now a useful addition to her imaginary world, but he won’t always comply. “Stop that! Don’t chew your crown!” she’ll squeal. He won’t take stage directions. “The whole castle is asleep until true love’s first kiss and he is clambering on a chair!” she protests. Even as we walk down the street or play in the park, she’ll spot someone, a slightly older girl, always with very long hair and consistently wearing the sort of outfit that I wouldn’t dream of letting Dulcie wear until she’s oh, I don’t know, nineteen and able to buy it herself and even then her father and I will roll our eyes and ask if she’s going out like that; and she’ll say, “I’m being that girl with the high heels and the halterneck.” And that’s all it is. She knows nothing of them, and is sensibly clad in flat sandals and the sort of European, folksy clothes I love but she wrinkles her nose at, but suddenly, her walk changes and she’s flicking imaginary tresses, and eating pretend forbidden foods like lollipops or sweets. Pitschi is a kitten with dreams. She eschews the typical kitten activities of climbing and chasing enjoyed by her four siblings, and as “the smallest and daintiest”, she sits in a basket, dreaming, and finally decides to go “looking for something else entirely.” As always, in children’s books, this quest to expand one’s world doesn’t go to plan, and after trying out and dismissing life as a rooster, a goat and a duck, Pitschi finds herself dripping wet, hanging out with some rabbits and being menaced by foxes and owls. Whoops. Poor Pitschi endures a very long and slow convalescence (my word, I loved characters who feel into feverish sleeps and needed to convalesce when I was a child) but takes this time to realise that Lisette, the lady who owns Pitschi is actually pretty damn lovely, and worth hanging around for. Lisette and all the other animals featured throw a gorgeously illustrated party to cheer Pitschi up, and to me, this is the point of Pitschi. The text could read ‘blah, blah, blah, blah’ for the twenty or so pages, and I simply wouldn’t care. 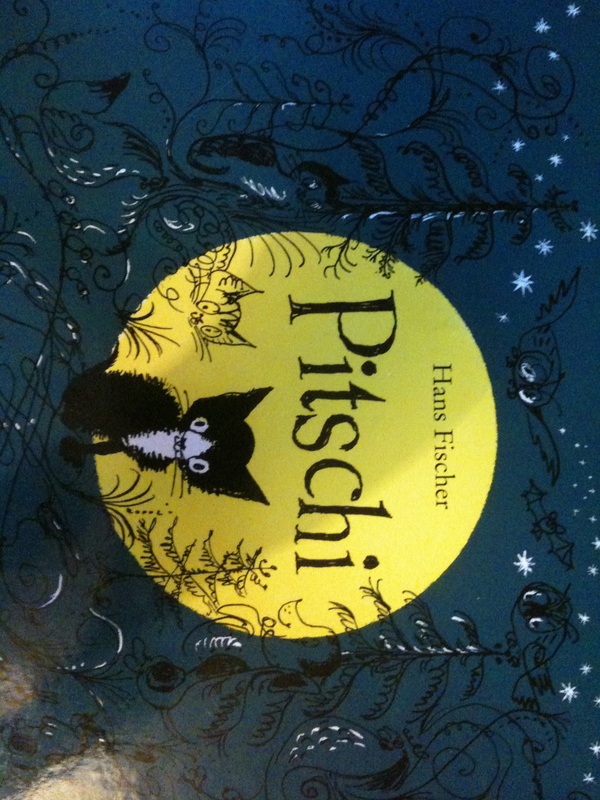 Hans Fischer has produced some illustrations that are so breathtakingly gorgeous that Marianne Martens probably didn’t need to translate this book, and I’d have have bought it any way (as it happens, I didn’t actually buy it. It is a much loved gift and I book I intend to buy for anyone who I love enough). Pitschi is drawn to be skittish and with an insouciant charm, while the swirling palette of colours around her show the bustle and flow of any youngster’s world. Rather than being traditional water colours or oil paintings, Fischer has used stone lithography, a print making process mostly used for fine art. And very fine this art is. The book is so beautiful that I am sorely tempted to buy another copy, and frame the pages. Seriously, you could look at this book then glance over at Peppa Pig, and would feel that somehow that garish image would sear the retinas of any child and leave them impoverished and unable to appreciate these pages of loveliness.